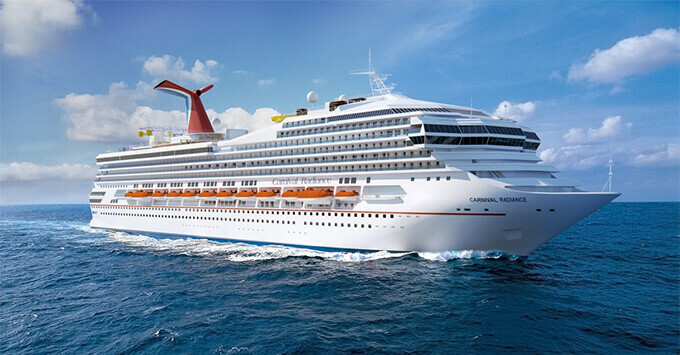 (8:00 a.m. EDT) -- Carnival Victory will undergo a nearly $200 million makeover in 2020 during a 38-day refurbishment in Cadiz, Spain that will see it emerge as a wholly new ship, Carnival Radiance. It will be the third ship in the Carnival Cruise Line fleet to undergo such a massive refurb. Carnival Destiny became Carnival Sunshine in 2013 after a $155 million overhaul and Carnival Triumph will be transformed into Carnival Sunrise in March 2019. The 2020 refurb, which will take place from March 18 to April 26, 2020 will see the ship receive several branded food, beverage and entertainment attractions, as well as stateroom enhancements across all accommodation categories. Highlights will include the introduction of several specialty dining venues, as well as a ropes course and waterpark. The addition of many of the line's signature spaces to the ship is part of Carnival's multi-ship initiative to standardize the cruising experience across the fleet, Carnival Chief Operations Officer Gus Antorcha said in an interview. "We're adding the spaces that guests really love," he said. "Every ship, every itinerary, every port will have these spaces." Among its new dining venues, Carnival Radiance will feature four specialty restaurants, a redesigned Lido buffet, and a dedicated Chef's Table space. Two bars will also be added. These new spaces will be in addition to the venues already onboard including Guy's Burger Joint, BlueIguana Cantina, RedFrog Rum Bar, BlueIguana Tequila Bar and Alchemy Bar. Cucina del Capitano: Offers a pick-your-own-ingredients pasta bar for lunch at no additional fee and popular Italian favorites at dinner for $15 per person. Fahrenheit 555 Steakhouse: Carnival's popular American-style steakhouse, perfect for celebrating special occasions at a reasonable price of $35 per person. Bonsai Sushi: A full-service Asian restaurant offering an array of a la carte sushi, sashimi and rolls, as well as a limited hot menu. Guy's Pig & Anchor Bar-B-Que Smokehouse: A casual, complimentary open-air eatery featuring barbeque favorites from Food Network star Guy Fieri. The Chef's Table: The line's exclusive multi-course meal will take place in a dedicated glass-enclosed space in the forward dining room. Lido Marketplace: The ship's buffet will be expanded to include stand-alone specialty spots such as Seafood Shack, offering lobster rolls and other New England-inspired seafood fare at a la carte prices, and Pizzeria del Capitano serving up several varieties of pies free of charge 24/7. JaveBlue Cafe: An expanded version of the line's coffee bar that offers lattes, cappuccinos, "spiked" coffees made with liqueurs and tempting pastries. RedFrog Pub: One of Carnival's most popular nighttime venues, the Caribbean-style pub features a variety of rums and beers, as well as Carnival's own ThirstyFrog Red. Piano Bar 88: Carnival's popular piano bar, but with a twist that amps up the fun with themed nights and new decor. Carnival Victory may not have had a lot going on outdoors, but Carnival Radiance will have no such issue with the addition of some of Carnival's most popular outdoor attractions. WaterWorks: The ship's waterpark will feature a 203-foot-long AquaTunnel slide, the line's signature 212-foot-long Twister waterslide and a 75-gallon PowerDrencher tipping bucket, along with a kiddie area. SportSquare: All the outdoor fun you could hope for with a suspended ropes course, basketball court, jogging track, ping pong, foosball, pool tables and nine-hole miniature golf course. Serenity Retreat: An adult-only oasis for anyone who needs a break from the kids; offers plush chaise lounges, whirlpools and oversized umbrellas. Lounge spaces on Carnival Victory will be reconfigured for Carnival Radiance to make them more consistent with other ships. Limelight Lounge: Home to the Punchliner Comedy Club, which features family-friendly and adult-only comedy; Limelight is also usually the spot for karaoke. Liquid Lounge: The existing theater will revamped to make room for the line's high-tech Playlist Productions revues. Carnival Radiance will also feature a Cloud 9 Spa with more space for a thermal suite, more treatment rooms and a wide selection of cardio and weight-training equipment. For those who wish to stay connected throughout their cruise, Carnival will deploy its Next Gen connectivity system onboard to bring faster, more reliable Wi-Fi to Carnival Radiance. All cabins on the ship are being redone as well, a process that's already begun and will be completed by the time Carnival Victory goes to dry dock, Antorcha said. More suites will be added above the bridge, bringing capacity of the ship to 2,984 from 2,764. Itineraries for the newly renamed Carnival Radiance will be announced in mid-November 2018. The launch of Carnival Radiance in 2020 will be treated as that of a new ship, with a godmother and inauguration, Antorcha said. "The extent of the work really merits renaming the ship," he said. "This will feel like a new ship."